宏村Hongcun Village had its beginnings back in the 宋朝Song Dynasty (960 - 1279) when the 汪氏族Wang Family decided to settle in the area in 1113. The village was then called 弘村Hongcun (same pinyin but different characters in Chinese). During the 明朝Ming Dynasty (1368 - 1644), the Wangs decided to overhaul the design of village; they consulted an expert in geomancy to examine the area and confirm on the placement of various elements. The result was the classcial placement with the 雷岗山Leigangshan Hill in the rear and its entrance facing south. Water from 西溪Xixi (West Stream), located to the west of the village, is led into the village interiors through an ingenious irrigation network. These man-made canals, which can be 1 meter wide, pass through 57% of all households (about 218 households); and often these water are routed into the interiors of buildings to create water gardens and fish ponds. On its way the streams formed the moon-shaped 月沼Yuezhao lake (originally a small spring) in the center and the bow-shaped 南湖Nanhu (South Lake), the exit end of the waterways, in the southern end of the village. The waterways, together with the two lakes, provide direct fresh water to about 83% of all households (about 318 households) or about 89% of the population. 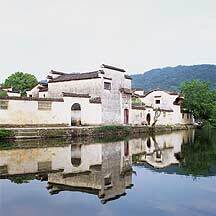 During the Qianlong period of the 清朝Qing dynasty (1644-1911), the village went through another major renovation. It changed its name to 宏村Hongcun and from then on remained very much the same as today. 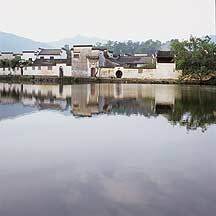 At present, it contains 1 well-preserved Ming building, 102 Qing buildings, and 34 Republic Era buildings. 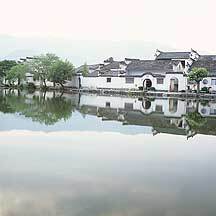 Rows of houses by the north shore of the stomach-shaped 南湖 Nanhu (South Lake). The background hill is the 雷岗山 Legangshan. Rows of houses by the north shore of the stomach-shaped 南湖 Nanhu (South Lake). The lake has a surface area of 20,247 meters, a length of 833 meters and a depth of 1.5 - 1.8 meters. Part of the 雷岗山 Legangshan hill is clearly visible in this photo. In the distant is the lovable stone bridge name 画桥 Huaqiao (literally, Picture Bridge). Photo taken from the south shore of the lake. The view from the south side of the large lake is the most popular. It is the distinctive skyline of the village. The picturesqueness of the place is unavoidable. Taken from the causeway looking east. Early morning. Taken from the causeway looking east. Besides the Leigangshan hill to the east are farm fields. Most of the south side of the lake are lined with trees. On the causeway. The causeway, built in 1956, span across the middle of the South Lake. On the north end of the causeway. By the north shore are stone benches for the villagers to enjoy the day. Near the end of the day and after dinner, people will gather here. Dogs,cats,carps and birds are popular here. Like 西递Xidi, 南屏Nanping, and 关麓Guanlu, the other villages that I visited in the neighboring area, 宏村Hongcun village is located in 安徽Anhui Province, 黄山市Huangshan City, 黟县Yixian County. 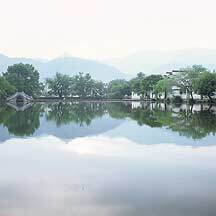 To get to Hongcun, one usually stops in 屯溪区Tunxi district, the governing seat of the city, and the name of the city before the extremely popular Huangshan mountain took the title. This is the third time (2006) I was here. I travelled here in 2001 to climb 黄山Huangshan Mountain. Then, in 2004 I visited 棠越Tangyue and 唐模Tangmu village in 歙县Shexian county, and 西递Xidi in 黟县Yixian county. In each time I took the long-distance bus to Tunxi from 杭州Hangzhou, the provincial capital of 浙江Zhejiang, and each ride was shorter and better - from 8hrs to 6hrs to 4hrs on better and better road. You can get to Tunxi by plane but only through domestic flights. The airport is within the Tunxi district. By train and long-distance bus is very easy, Although you still need to get to a major city (usually a provincial capital, like Hangzhou or Wuhan) close to Huangshan city first as it is not a major city. Hongcun is in Yi county, so one usually get a ride from there to the village. Foreigners, or at least non-chinese, need to get a permit to see these places. The permit can be obtain from Tunxi's PSB. As I have never looked at one, I don't know what is involve. Inevitably, there is a fee, which I had read to be about 60 yuan. Just be sure that the permit has the places listed on the permit. Transportation:There are buses to both 黟县 Yixian (Y9 and takes about 45mins - 60mins in 2006) and 歙县 Shexian (Y5 and takes about 30mins in 2006) counties from outside 屯溪Tunxi's bus station. Be aware that the counties are in the opposite directions, so confirm with the driver that it is going in your destination. 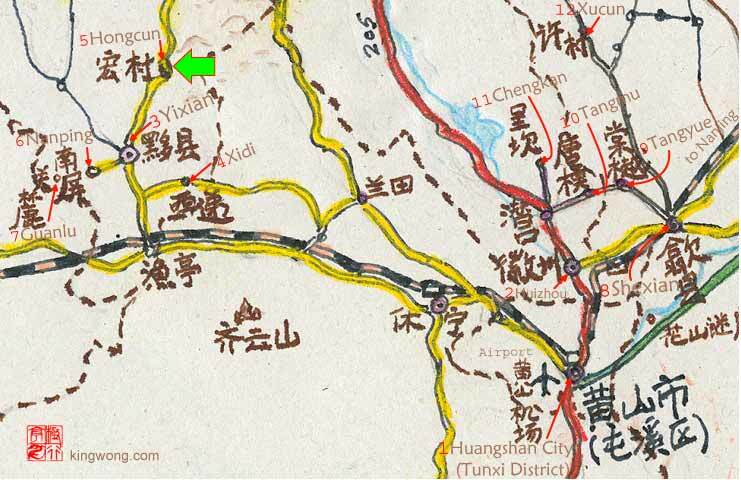 From Yixian, there are public buses (Y2 and takes about 30mins in 2006) to the village to the village. These buses normally waits from across a short stone bridge not far from the bus station. Besides going to 宏村Hongcun, the buses also go to neighboring villages such as 西递Xidi, 南屏Nanping, and 关麓Guanlu. Signboards with the name of the villages are usually placed on the driver's front window; if not, confirm with the driver that it is going to your village. If you are in a hurry and there is no public buses there are always plenty of minivans for hire that will take you there (about Y15). Other alternatives are to hire a van in Tunxi and go straight to the village. This may cost alot more (probably about Y100), but if you have several people this may be much faster and easier. She accepts anyone but only speaks Chinese. Her pretty and assertive daughter may know some words of English. But I think hand gestures is enough to get by the day. 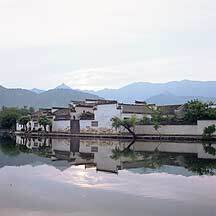 In Hongcun village:Family-style guesthouses and hotels are easily available here. The cost was usually Y20 and up. Nanping had about a thousand residents in 400 households. So it is a decent size village with enough activities to keep you busy for a day. During the high seasons, there can a large number of tourists. At the time the village hosted two art schools, so expect plenty of students. Mr.Wang only speaks Chinese, but will be glad to take anyone. He will also cook your breakfast, lunch and dinner, if you like, and proudly show you his water garden and pavillon where you can eat while admiring the goldfishes and carps looking at you. There are also rooms that are centuries old, so if you are in the mood you may also rent one. While strolling along the Crescent lake on my second day here, the old woman took a break from washing and came over to me to ask if I needed a room. I replied that I already have a room. She smiled and reminded me of the beautiful pool here; to live beside it would be a thing to remember. I nodded and followed her into her large house. We passed over the arched doorway and stepped into what may had been the guestroom, the primary room where guests are hosted, but is now usually served as a eating room. We left this room through a narrow doorway on the left and enter the rectangular courtyard. The courtyard was stone-paved and on it were some small trees and flowers on pots and some furnitures and screens. She openned a door to a room on the side and I stepped in. It was a small dim room. A single barebulb was hanging on the ceiling and she pulled it on. The ancient bed sat in front of me. You see it all the time: in films, in books, in the museums. It shapes like a legged vertical box with one of its four sides open; on the frames were delicate wood carvings. The whole construction was of wood, and it showed their age through traces of human touches that slowly changed the tones of the otherwise even monotonous finish. Two pink curtains hung on each sides, two embroidered pillows lay on top of a neat bed padding. In the morning you wandered through the alleys and marvel over the intense architecture; at night, you would like to return to the quiet pool and reflect, then move on through the maze of rooms and hop onto a bed that fit the reputation of the whole place. This is what you came here for. Soon the old woman asked whether I liked the room. I openned the window door to look outside at the courtyard. If only there were plum trees and magnolias blooming; if only there was a large rock; If only this interior was more alive. I told her I would think about it and come back if I decided to rent it. Food in the village are the homemade style. All your hosts will cook for you with any fresh produce from the market. Since the village isn't very big, everyone tries to be unique, and many have inherited recipes. There are all sorts of things you can try out, like the egg rolls that a woman makes on the street with a hot plate, various breads, crackers and cakes, and the very thin pancakes that have various favors, like corn, mellow, apple and 20 others that I couldn't remember anymore. But you will meet these as you walk around the area. The same stuffs you see in Tunxi, plus the intricate wood-carving panels. Don't expect them to be authentic (these are not made during the Ming or Qing dynasties nor probably 50 years ago, although the carvings maybe as good or even better), unless you really know these things. But if you really like them, buy it. They make great show pieces. There is a 中国农业银行Agricultural Bank of China inside the village. You may exchange major foreign currencies for 人民币Renminbi here. To exchange traveler's checks for RMB, you need to go to a major Bank of China. I don't remember whether there is a Bank of China outside the village where the bus station is. If there is one, they might take the traveler's checks since this is a popular international tourist area; otherwise you need to go back to the Bank of China in Tunxi. I remember there is a internet cafe in the village. I am quite sure there is one across the bridge. The village is relatively quiet at night, but across the stone bridge area is very lively. There are many vendors selling food and gift items, and there are music. No one really check your tickets at night but always hold on to it til you are done with the place for good. Foreigners or non-Chinese, need to get a permit to see these places. The permit can be obtain from Tunxi's PSB. As I have never looked at one, I don't know what is involve. Inevitably, there is a fee, which I had read to be about 60 yuan. Just be sure that the places are listed on the permit.